We were excited that Eaton decided to partner with our team at the Platinum level as we designed, built, and raced Novum! While this was not Eaton’s first cycle with the team, we were thrilled by their increased involvement this cycle! This build cycle, we had the pleasure of collaborating with Eaton on multiple facets of our car. Eaton provided products that helped in the assembly of Novum over the summer of 2017, as well as engineering support throughout both 2017 and 2018 as we raced Novum in 2 races. The Eaton team was eager to help our team as they looked for a platform to showcase advancing technologies. And 2017 was a great year to do so, because UM Solar Car pushed the bounds of what a solar car can and should look like, building a radically small solar car that sports a state-of-the-art, space-grade, multi-junction gallium arsenide array. We appreciate Eaton providing us with machining and real-world products from their catalog. All of these products and machining were key to our success in 2017 and 2018. We can’t thank Eaton enough for the contributions they made to Novum to ensure the car is safe, reliable, and as efficient as possible. Eaton helped develop Novum’s array stand, which was integral to our competitive advantage; it allowed us to get the most out of our state-of-the-art array. 2017 Race Mechanical Engineer, Jake Anderson explains that “Eaton machined three sets of array stand components for us. Without these components, the car would not have functioned, making [Eaton’s] contribution critical to the success of our vehicle.” These components allowed our 2017 Race Crew to raise Novum’s array and angle it in the optimal position. This positioning maximizes the power that the array takes in from the sun. The array stand components were of the highest quality; Eaton anodized them, giving the metal parts a thin coating to ensure that no corrosion develops. As we head into the design cycle for our 15th car, we are looking for new ways to collaborate with Eaton, both in using more of their electrical products and gaining help with engineering design and machining. IMRA’s support and donations to the University of Michigan Solar Car Team over the past eight years were crucial to the team’s second place finish in the 2017 Bridgestone World Solar Challenge across the Australian outback this past October, and to our ability to race in the 2018 American Solar Challenge this summer. As a team that’s driven by technology, we are always happy to receive support from companies that see the value in pushing technology and doing something new. For our fourteenth generation car, the team decided to make a leap and use a state-of-the-art, space grade, multi-junction gallium arsenide array. This solar array is not only highly efficient, but also very expensive. Novum would have remained a UM Solar Car dream without the multi-junction array, which we could not have purchased if not for IMRA. “Without IMRA’s support, Novum would not have been financially viable,” 2017 Race Crew member and the team’s resident financial wizard, Neil Jain, explains. If we hadn’t built a car as aerodynamic as Novum, it is unlikely we would have gotten the amazing result of a best-ever finish by a University of Michigan Team, so we were excited to be able to take Novum out of our Computer Aided Designs and onto the road with the help of IMRA. IMRA has continually supported UM Solar at every turn, helping us make connections in industries that have greatly benefited the team. Our 2017 Project Manager, Jonathan Cha, emphasizes our valuable relationship with IMRA: “Our team and IMRA have shared an almost decade-long relationship. We’re both located in Ann Arbor and share a similar passion in innovative technologies. Even though we have different focuses, between high-powered lasers and solar-powered vehicles, IMRA has supported us and our endeavours in the American and Bridgestone World Solar Challenges. Our team is grateful for IMRA’s continuous contributions and friendship. Without it, the students who have been on this team would not have had the amazing experiences and opportunities they have today.” We always love working with IMRA, we can’t thank IMRA enough for all that they have done for us, and we’re looking forward to working with them more in the future! General Motors has been a staunch supporter of the University of Michigan Solar Car Team since the team’s inception, and we have been delighted to partner with them again as we prepared to race Novum both across the Australian Outback and along the Oregon Trail! In addition to the financial support from General Motors, having access to GM vehicles throughout our design and build cycles were critical. We have utilized vehicles that GM provided not only to our team, but also to the entire Wilson Student Team Project Center. The team has used the vehicles for everything from making runs to pick up materials and parts for the car to taking the car to an elementary school to teach young students about the importance of STEM education and the future of renewable energy. Having access to the Suburban gave us the ability to take large numbers of team members to downtown Detroit for the North American International Auto Show, allowing us to represent our team and sponsors at this important event. And having access to the GMC Sierra and multiple Silverado trucks has made it easy to trailer Novum to where the team needs her to be, particularly for race-critical purposes like on-road testing or caravan training. The ability to train on road, make supply runs, attend meetings with sponsors, and interact with the public helps the team function like a well-oiled machine. Mobility means a lot to our operational efficiency. Use of the GM cars as caravan vehicles during our current mock race and the 2018 American Solar Challenge, where we seek our seventh consecutive title, is extremely valuable. All our caravan vehicles provide crucial race support and help us race safely and smoothly. 2018 Operations Director Vignesh Jagathese describes, “Without GM vehicles, we wouldn't be able to race 1,800 miles through the American heartland to go after our 10th American Solar Challenge title. GM vehicles form an integral part of our fleet, from our Chase Vehicle, which acts as our mobile mission control and houses our Head Strategist and Crew Chief, to our Lead Vehicle, which drives directly ahead of the solar car and advises upcoming road conditions.” These vehicles have been critical during our mock race and will continue being integral as we go on to race across the country. We are grateful for GM’s continued support in providing both these vehicles and financial support. The team is looking forward to continuing collaboration with GM! Ford helped the University of Michigan Solar Car Team at every step of the way, from car construction to race preparation and finally, to the 2017 Bridgestone World Solar Challenge itself. When we built Novum, Ford milled plugs from our tooling board for us to use in our composites manufacturing process. Building an all-carbon fiber car is no small feat, and having Ford’s help with this all-important step ensured that we put our best foot forward in this difficult process. These plugs enabled us to make our molds, and our molds enable us to make our carbon fiber chassis, canopy, upper, fenders, and fairings. Ford-milled plugs were the first step in building our entire aerobody. This means that Ford Milling had a direct hand in helping the University of Michigan take its most aerodynamic car to date off of the drawing board and into reality. Once we finished building Novum, BWSC preparations were not over. Ford yet again graciously allowed the University of Michigan Solar Car Team to test its solar vehicle in its Jacobs Wind Tunnel. There, in order to gain a better comprehension of the performance and efficiency of Novum, team members conducted various aerodynamic tests. And because we were testing in Ford’s wind tunnel, we were able to acquire numerous data points for a wider range of angles and speeds than we otherwise could have. We covered Novum in tell tails, strings attached at several points on the car that enabled our engineers to gauge turbulence and air flow. The team also performed other air flow tests at different yaw angles. Injecting smoke into the wind tunnel, for example, granted the team an opportunity to observe with great visualization where Novum has flow separation along its aerobody. All these tests and coefficient calculations had far-reaching benefits for Michigan’s racing efforts. Being able to accurately quantify these aerodynamic values meant possessing reliable numbers that we could base our race simulations on; this helped our Strategy Division make decisions and plan ahead when on the road in Australia. Ford also influenced our race operations, providing us with our Lead, Chase, Scout, Weather, and Media caravan vehicles in Australia to support Novum’s trek across the Outback. Being able to race with this full caravan meant that Novum had the support she needed and our Race Crew’s capabilities were not limited. Ever a staunch supporter of the team, Ford was integral to the University of Michigan’s recent historic finish in the 2017 Bridgestone World Solar Challenge. We are now working together in preparation for the 2018 American Solar Challenge, making sure our team successfully modifies Novum to comply with regulations. For example, Ford milled the plug for our new canopy, which is currently in the process of being built. We are very grateful for the past 25 years of partnership with Ford, and we look forward to continuing collaboration in the future! It can be said that for any car, multiple things need to go well. The engine must run, the wiring must connect, the driver interface must be well put together, and the motor must be fully functional. That’s not even getting into all the aspects that comprise the vehicle’s aerodynamic design. However, no aspect of vehicle building or planning can come to fruition without what is likely one of the most fundamental components of any car: the wheels. It is the wheels that literally move the car forward, and bring the driver to his or her destination. And ZF was there for us to ensure that Novum, our smallest solar car, would move forward. “Without ZF’s machining capabilities, we wouldn’t have been able to manufacture our front and rear wheels,” says 2017 Race Mechanical Engineer Jake Anderson. Thanks to the reliable wheels we had machined by ZF, we were able to move full speed ahead—both literally and figuratively—to our first-ever 2nd place Bridgestone World Solar Challenge finish. In Australia, we had a lot riding on our performance. We were experimenting with a new aerodynamic design, and consequently had much to think about in terms how we would adjust our race strategy to meet this new design. Add this onto the fact that we were dealing with exposure to some of the harshest natural elements the world has to offer, and this can easily seem like an overwhelming situation. Having durable, reliable, and versatile equipment is integral to the survival of any vehicle, but ZF’s wheels went above and beyond. Not only were they of the utmost reliability, but they helped us thrive under the extreme temperatures and extreme road conditions of the Outback. In the past, many of our wheels had formed cracks in the rims, leading to the team spending precious race time on taking care of these structural issues. ZF’s machining capabilities were of great help to our mechanical team. Their knowledge and analysis of the crack formations on our previous wheels allowed us to fine tune the wheels we ended up using. Our historic second-place finish did not come without great effort—but it wasn’t just our own efforts. ZF’s hands-on, professional, and world-class assistance helped us move forward in this race—and that is something our members still speak of nearly half a year after the race. Thank you, ZF! We couldn’t have done it without you! In our day-to-day lives, we are rarely more than 10 feet away from 3M technology. 3M is a company rooted in scientific exploration and discovery, and they are ever evolving. They believe that science is just science until it is used to solve a problem. And that is exactly what is reflected in their vision: 3M technology advancing every company, 3M products enhancing every home and 3M innovation improving every life. And for those of us at UM Solar Car, 3M’s unique versatility could not be more evident. For the 2015 race cycle, 2016 American Solar Challenge, and our most recent 2017 Bridgestone World Solar Challenge, 3M provided us with a multitude of equipment including, but not limited to: DP 460 glue, 471 vinyl tape, electrical tape, glass bubbles, duct tape, sandpaper, orbital sanders, full body suits, and respirators for safety. 3M has been an invaluable sponsor to the team, and a quick walk through our workspace will show the absolute ubiquity with which we use 3M’s tape, adhesives, and safety equipment. The 471 vinyl tape serves a crucial role through its adhesive strength as it holds the fairings to the chassis of the car and eliminates gaps between individual components so as to maximize aerodynamic efficiency. The full body suits and respirators have proven essential through their reliability and durability as they are staple tools in making sure our team members stay safe and clean when working with components which could potentially pose health risks. The electrical tape and heat shrink insulate the wires of the vehicle, preserving the functional and structural integrity of our electrical components, and the vinyl car wrap aesthetically topped off Novum, providing her with a sleek, colorful appearance and complementing her already strong aerodynamic efficiency. In our most recent race, the 2017 Bridgestone World Solar Challenge through the Australian Outback, we were exposed to terrain which challenged us and pushed us to our technical, mental, and physical limits. As a team, we were working with the novel, boundary-pushing design of our smallest vehicle yet, Novum. Along with this came exceedingly rigorous scrutiny, planning, and labor, both internal and external. However, 3M’s products and support were key in helping us maintain the structural integrity of our vehicle and the well-being of our team members, allowing us to power through with Novum and race to 2nd place, our best yet World Solar Challenge finish. According to UM Solar Car Operations Director Vignesh Jagathese, "3M has consistently helped the University of Michigan Solar Car Team through our toughest design cycles. 3M products are heavily used in our manufacturing process, and the high quality of their products helps us build the fastest car possible." It would take pages to fully describe the value that 3M so graciously provides us as a team, but the overarching idea can be summed up in one phrase: 3M holds us together, both literally and figuratively. Thank you, 3M, for being everything from the shield that protects us to the adhesive that binds us. We look forward to seeing what we can accomplish together in the future! At Michigan Solar Car, we pride ourselves on our partnerships in industry. As an organization with goals to achieve environmental efficiency, greater connectivity, as well as technical prowess, it is a huge part of our goals to involve ourselves with partners within the automotive industry in the Greater Detroit Area. Part of achieving and maintaining our levels of technical innovation involves rigorous design, redesign, and further examination from all members of our team on every component. This year, we partnered with JTEKT, a huge supporter of our efforts in order to work on one of the most ubiquitous parts of a car, the wheels. Wheels are crucial to the functionality of a vehicle in the way anyone would think of. Wheels produce the friction and rotational motion that are required to move the vehicle forward, backward, and in any direction. They can be put together in many ways, but the smallest of components related to the specific design of the wheels are what can make or break our level of performance. This year, we took a huge leap forward and a huge risk with the novel design of our vehicle Novum. Novum had an innovative aerodynamic structure and space-grade Gallium arsenide solar cells incorporated into its array. However, without highly-functioning wheel components, which are one of the physical bases of movement to our vehicles, all of that would be for naught. This is where JTEKT came in. We were provided with bearings for our wheels, modeled down to the most minute specifications. Technical performance comes from many parts, with one of the most important being the very wheels which move the car itself forward. Bearings are sets of spherical components held together by metal rings known as races. JTEKT provided us with durable and meticulously engineered hybrid ceramic ball bearings with silicon nitride. High-performing bearings are essential to wheel performance as the size and texture are what allow the wheels themselves to spin with as little friction as possible. Without high-quality bearings, our car is unable to move quickly or efficiently. While physically small, the bearings that JTEKT provided were huge in the overall impact, quality, and performance of our vehicle. Thank you, JTEKT, for being an integral part of the efforts which move us forward and the spirit which keeps us going. Teijin was integral to the University of Michigan’s historic 2nd place finish in the Bridgestone World Solar Challenge, providing us with the materials necessary to build our incredible car, Novum. Nearly all of the composite fibers for the car came from Teijin. Teijin gave UM Solar Car high graded prepregged uni-directional carbon fiber to reinforce stress points, prepregged carbon fiber weave for internal aero parts, and Aramid Twaron fabrics for the undercarriage of the car and the sidewalls and roll cage of its chassis. This all translated to a significant amount of weight savings, shaving off countless precious minutes and contributing to our great race time. And thanks to the high quality of Teijin materials, we were able to proceed with construction and racing with full confidence in the structural integrity and safety of our vehicle. Twaron, for example, increased the impact resistance of the carbon fiber laminate, ensuring superior protection in the event of a crash. Bit by bit, we pieced our car together using Teijin carbon. And we are very grateful that was the case, because the superior quality of Teijin’s product allowed us to build the best possible manifestation of our bold monocoque design. “The carbon was some of the highest quality in terms of material property that the team has been able to get in recent years,” Composites Lead Bennet McGlade describes. Teijin allowed Novum to be as formidable and competitive as we had envisioned. During the design phase, Novum’s aerodynamic efficiency was always a top priority. Novum’s ultra-small body maximized aerodynamic efficiency and went against the widely-adopted credo in solar racing that maximizing array area and building a larger, less aerodynamic car is the best strategy. With this unconventional smaller solar car, Michigan Solar Car hoped to go big by going small, and building with Teijin’s high-quality carbon fiber equipped us to do just that when the time came. Thank you, Teijin! We could not have done it without you! Now, heading into the 2018 American Solar Challenge, we can feel confident; we know that in partnering with Teijin, we put our best foot forward during the manufacturing process and built a car that was safe as well as fast. After all, we built Novum with some of the absolute best carbon and aramid in the world. The University of Michigan’s 2017 vehicle’s carbon fiber aerobody and state-of-the-art array are exciting, but beyond the car’s exterior are other crucial elements, things like the steering rack or the microsystems--or the battery. Elcon Precision supported UM Solar Car by helping us optimize our car’s battery pack; Elcon supplied our team with copper tabbing, which allowed us to custom-design our battery pack. In addition to providing us with custom copper tabbing, Elcon also advised our team on its design, revising the drawings of copper tabbing our engineers sent to them. Copper tabbing involves welding copper to a battery in order to strengthen and aid electric current. For us, this is a crucial step in the battery-building process because incorrect welding of this copper increases the chances of experiencing voltage drops. This would make life for Novum particularly hard; as a car whose sole energy source is the unreliable sun, it helps to have a dependable battery pack. Chemical etching is a controlled material removal process that results in complex parts and is capable of producing great detail. Using chemical etching, Elcon very accurately cut thin, reflective materials without any of the edge warping that Brad mentioned would threaten the quality. Elcon helps make our battery so reliable because its copper tabbing is such high quality. Thanks to Elcon Precision’s expertise, UM Solar Car built a strong battery that helped successfully carry Novum across the Australian Outback to a historic second place finish! Thank you! 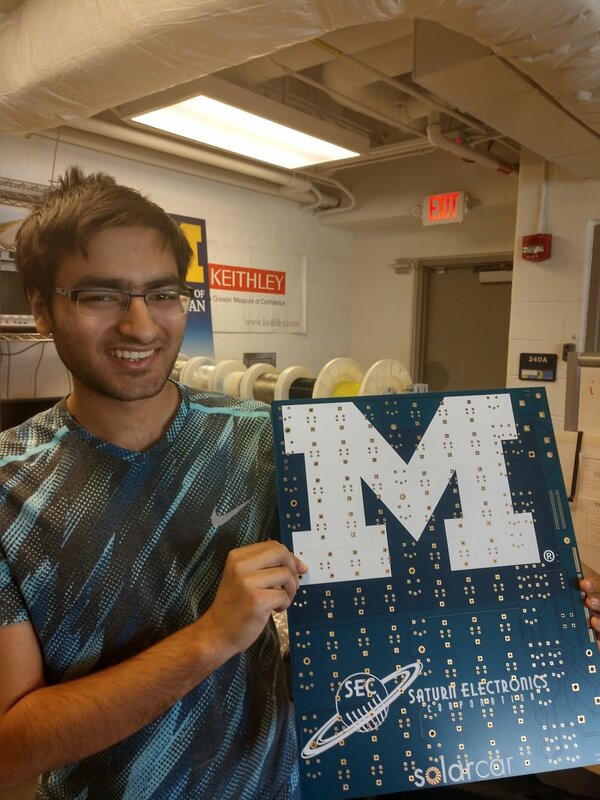 Molex, LLC has long been a valued sponsor of the University of Michigan Solar Car Team, supporting our operations with top-of-the-line connectors that make our system reliable, polished, and easy to repair. Molex provides UM Solar Car with over a thousand Micro-Fit and C-Grid connectors that our electrical engineers solder onto the printed circuit boards (PCBs) that support various systems of the car. These connectors then plug into other matching Molex connectors, which all feed into the Control Area Network (CAN) line, a harness of wiring that connects all the circuit boards within the car, tying it all together like a central nervous system. Race Crew Electrical Engineer and Driver Caroline Subramoney has a lot of praise for Molex! Molex connectors boast an incredible ease of use that facilitates repairs and overall utilization. They latch into place, simplifying the process of detaching and reattaching new circuit boards, which comes in handy in the event of a failure on the team’s part because it enables a speedy and effective recovery—something that is especially crucial in the middle of the race. And although our electrical engineers could have just soldered the wires in, it would be unwise to place 12 volts so near to the ground and position the two CAN communication lines close to one another without Molex connectors to provide insulation. “Without Molex connectors,” Caroline explains, “doing this would be risky at best and catastrophic at worst.” Molex made it possible for us to build the optimal solar car by allowing us to be flexible in ways like this when designing our microsystems. “Molex has never failed us,” Caroline aptly praises. “I'm ecstatic we had the opportunity to work with them as a sponsor!" R Systems played a key role in helping the University of Michigan Solar Car Team design its successful solar car, Novum, giving our engineers the capability and flexibility to run crucial aerodynamics simulations. The aerodynamics simulations, Computational Fluid Dynamics (CFD) tests, require a great deal of computational power, and R Systems provided us with that power. The team needed to assess canopy shape, lower shape, array shape, trailing edge, leading edge, and other characteristics--to develop a strong aerodynamic design, UM Solar Car had to put our best foot forward in regards to all these aerodynamic components, and we had to do it quickly. During the design cycle, our team works at a rapid pace and on an exacting timeline. If certain benchmarks are not reached, the whole project is in jeopardy. Our engineers work often well into the morning; they know that if designs are not improved upon and finished on time, the car cannot be built on time and cannot be shipped on time and so cannot race. But designs cannot be improved upon in a timely fashion if they cannot be assessed quickly, and on a typical desktop computer, running just one CFD simulation can take an entire day. Over the course of our entire design cycle, the Aerodynamics Division ran over 200 simulations. With one a day, that would mean 200 days, and the team did not have that kind of time to wait around for results to come in one by one. “When the team needs to iterate over a number of different aerodynamic components of the car, the design process can easily span more than a year,” explains 2017 Head Strategist Alan Li. But with R Systems’ support, we could complete a CFD simulation in not one day, but two hours. R Systems enabled us to not only run individual simulations more quickly, but also to run multiple simulations simultaneously without slowing down any running parallel to one another. This allowed us to maintain the fast pace our design and build cycles called for. And even more than that, this speed allowed us to try out a larger number of shape designs and afforded us more time to brainstorm and review results. The flexibility to explore a wider array of possibilities yielded a better car than we could have otherwise designed--it yielded Novum. As the University of Michigan came close to finalizing Novum’s design, R Systems proved very accommodating and supportive, helping the team when problems with the timeline arose. “We had only half the time to complete the task,” 2017 Aerodynamics Lead Jiahong Min recalls. “So, we contacted R Systems to ask for more resources. They got back to us almost immediately and gave us twice the computing power we normally get, allowing us to complete the design on schedule.” Within the span of just one week, UM Solar Car ran around 100 simulations with the computing power R Systems provided. One big thing that makes Novum impressive is its aerodynamic prowess and how its aerobody stands out from the rest, departing from solar car design convention. We were able to try something new and take that risk and execute it well because of R Systems’ support. And during the 2017 Bridgestone World Solar Challenge last fall, R Systems provided our Strategy Division’s Weatherman the capacity to run models while racing in the middle of the Australian Outback. The models take about six hours to run, which was quickly enough for our Strategy Division to analyze the results during the race and make important tactical decisions pertaining to speed and charging locations while on the road. With the help of R Systems, UM Solar Car stayed on track both during the design cycle and during the race. Thank you, R Systems, for making our historic finish possible! At Roush facilities and with the guidance of Roush expertise, the University of Michigan Solar Car Team built the carbon fiber body of our car, Novum, which brought home Michigan’s strongest Bridgestone World Solar Challenge finish yet, 2nd place. First and foremost, this means Roush provided UM Solar Car with vital access to a large, professional workspace for prepreg composites manufacturing, providing us the best possible venue to undergo this process. In doing this, Roush granted us the opportunity to use specialized equipment to enhance our efforts each step of the way. CNC (computer numerical control) knife cutters, for example, helped with kitting, which makes hand layup easier. Hand layup is a composite fabrication method that involves layering fabric onto the molds. The fabrics that will soon go onto the molds must first be carefully cut into specific patterns or shapes, and kitting makes fabric placement easier because it involves cutting sets of fabric patterns and assembling them into kits. Here, Roush’s CNC knife cutters allowed for precision cutting of our materials. Armed with these fabric patterns, the team began hand layup, hand-placing layers of dry fabric, or “prepreg” plies, onto a mold, which created something called a laminate stack. Then, resin was applied via resin infusion and the plies were then “debulked,” or compacted in a vacuum bag. This minimizes the creation of voids, or air pockets, in the laminate, which would likely weaken the composite. All the while, Roush staff were on hand, helping UM Solar Car build a better car by providing layup tips, watching for any errors, and advising team members on the best materials to use and where to use them. After debulking, it was time to cure the laminate. Roush’s facilities are equipped with car-sized ovens and large autoclaves, specialized equipment which were of great use to us. Being able to use an autoclave for this curing process was important, because it helped the team achieve an optimal resin-to-fiber ratio and to avoid the formation of undesirable voids. With such instruments at its disposal, Michigan felt confident that its painstaking work would yield lightweight, strong parts. Team members hard at work in Roush's facilities. Roush enabled us to build the car that performed so successfully in Australia this fall. With Roush’s support, the University of Michigan Solar Car Team moved its cutting-edge design into the three-dimensional world and made its vision a reality. We look forward to continuing this trajectory by collaborating with Roush as we make changes to Novum and prepare for the upcoming American Solar Challenge! Every solar race is different. Every race, we have a new Race Crew and a new car built around new regulations that ultimately shape design and fabrication. But one thing has never changed: Chuck Hutchins’ unwavering support of the team and its race towards a victory. Among the many things Chuck does for our team, nothing beats seeing him at the starting line waving the maize and blue flag loud and proud, guiding our solar car. Since he first ran with the car Maize and Blue in 1993, Chuck has given our cars this send-off at the start of nearly every solar race in a sign of solidarity and tradition. The 2017 World Solar Challenge was no exception, and we wouldn’t have had it any other way! Chuck has been a longtime friend of the team. 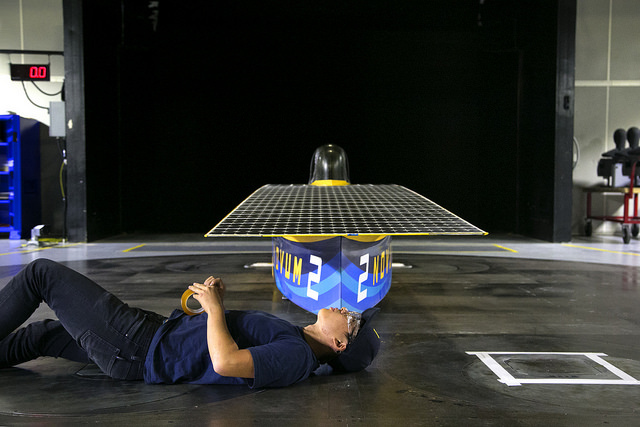 Since the very beginning, Chuck has been a mentor and advocate to the University of Michigan Solar Car Team. As a safekeeper of tradition and team culture, Chuck has instilled UM Solar Car values in generation after generation of our team. This cycle was no exception, with Chuck inspiring us to uphold and further the UM Solar Car tradition of excellence. Chuck studied Mechanical Engineering and co-founded Manufacturing Data Systems, Inc., and Chuck’s experience in engineering and innovation was invaluable during the development of Novum, our most daring vehicle to date. This cycle, Chuck also provided the team with monetary support that helped us make the dream of Novum a reality; when our engineers were working on Novum’s design, the largest hurdle the team faced was financing the car. Chuck’s contribution set us one step closer and eventually helped this dream come to fruition. Chuck’s contributions didn’t end there, though. He was right beside Race Crew in Australia and treated them to several team dinners. After a long day of work, this was a great opportunity for Race Crew to decompress and spend time with Chuck, something they were very grateful for. To our biggest fan and longest supporter: thank you, Chuck! We could not have won second place without you! We look forward to kicking off the next race with you and to experiencing even bigger and better things together. The University of Michigan Solar Car Team was excited to partner with Cummins for the first time! Cummins’ support of this cycle was exciting for our team; at the same time that they venture further into the electrification space, looking to become a leader in electrification with their new electric semi-trailer, Michigan Solar Car took a radically different approach. Novum would not have been made possible without companies like Cummins who recognize the importance of innovation in both solar and electric vehicles. It takes a lot of guts to branch off of what engineers before you have done, and our team was lucky to find a company that not only ensures that they are doing that, but that students working on projects like Solar Car also have the opportunity to innovate and try new things. Our 2017 Business Director, Abigail Siegal, explains how significant Cummins’ contribution to the UM Solar Car Team has been, saying, “While our team has always built an electric car, this year we were also moving away from from our traditional path, making a shift from using a catamaran design to a bullet-shaped car. Without Cummins' support, our risk-taking wouldn't have been possible and we wouldn't have been able to have the success we did.” We were excited that this year we had our best-ever finish and were able to welcome Cummins to the University of Michigan Solar Car family! As we move into preparing for the 2018 American Solar Challenge and then the design cycle for our 2019 car, we look forward to partnering further with Cummins and continuing this tradition of striving for innovation! Thank you, University of Michigan College of Engineering! The University of Michigan College of Engineering is an indispensable partner of UM Solar Car, providing us with everything from our workspace and our students to financial support and media coverage. Our team is housed in the College of Engineering’s Wilson Student Team Project Center, the hub of all our operations. Here, the team designs, stores composites and materials, meets to discuss sourcing, hosts corporate sponsors, welds, saws, sands, and more. The Wilson Center is UM Solar Car’s home, and it’s where, bit by bit, Novum was born. Our space in the Wilson Center is vital to our operation. We are also very lucky and proud to be the University of Michigan Solar Car Team. Our recruits study at one of the top engineering schools in the world, and this means that our engineers are talented and dedicated, and well-equipped to handle the challenges of designing, building, and racing a solar car. "We are always grateful to the College of Engineering for drawing the bright engineers who make projects like Novum possible to Michigan, and for giving them the world class education needed to compete amongst the best teams on the planet," Project Manager Noah Bearman remarks. Michigan Engineering supported the team with funds, as well, helping us avoid a situation in which financial constraints could have prevented the construction of our faster, riskier, more innovative—and more expensive—design, Novum. During the 2017 Bridgestone World Solar Challenge, the College of Engineering also aided UM Solar Car with media coverage, posting on social media and publishing detailed stories and press releases about our Race Crew’s life in Australia, the excitement of the race, and the great meaning of our historic finish. UM Solar Car is very grateful for Michigan Engineering’s continued strong support, without which we could not have raced to our best-ever WSC finish. We look forward to what comes next and we are determined to continue representing our school proudly and successfully. Thank you! The 2017 Bridgestone World Solar Challenge was most certainly a leap forward for us as a team technically, personally, as well as strategically. Our new vehicle Novum pushed the boundaries of our team’s technical expertise. Our new design made the car adopt a narrow, streamlined aerodynamic design in order to leverage maximum output from our internal systems. We decided to implement a gallium arsenide array—different from the traditional silicon design with which solar cars tend to be built—in the hopes that we could utilize energy from the sun as efficiently as we possibly could. Above all, we raced with these innovations, realizing that what we were doing was uncharted territory. Thanks to our Michigan-based partner Saturn Electronics, we were able to power through this uncharted territory with all our systems working smoothly due to the high-quality circuit boards they provide us with. These circuit boards, printed and designed to maximum precision, allowed for Novum to be both reliable and efficient on the operational end of our vehicular design and racing, with the boards providing electronically connecting capabilities for our microelectrical systems. Our vehicle’s lighting board, horn board, steering dashboard, and battery pack, among many other components, were able to be integrated both smoothly and highly functionally into our vehicle, all thanks to Saturn’s engaging and efficient team. While these are ubiquitous aspects to any vehicle, Saturn’s circuit boards boast an incredible level of durability, functionality, and energy efficiency which we at UM Solar value immensely. There is always a lot going on during a race. From harsh terrain to strategic planning, a lot can happen during a race that we can’t always plan for. However, the high-quality circuit boards allow for us to save time and increase the reliability of our electric systems as their compactness, connectivity, and stability against movement make it easy for us to organize and utilize our multitude of electronic system components. In other words, if our racers, wheels, and battery make our car move, then Saturn makes our car work. "We wouldn't have microsystems without the PCBs that Saturn provides," 2018 Microsystems Lead Brendan Adkins remarks. "That's a big deal." From all of us at Michigan Solar Car, thank you Saturn, for your gracious and reliable support, and we are looking forward to what we can accomplish together in the future! Today, the University of Michigan Solar Car Team’s semi-trailer leaves for shipment to Australia for the 2017 World Solar Challenge. On arrival, it will participate alongside the team in our 3000 km World Championship race from Darwin to Adelaide. The semi-trailer– packed with crucial supplies– has a long journey ahead of it, and we have entrusted it to the capable hands of Höegh Autoliners. The trailer will leave the United States in Baltimore aboard the vessel Höegh Yokohama. It will then travel to Bremerhaven, Germany, where it will be transhipped on to Höegh’s Europe to Oceania service before arriving in Melbourne, Australia. There, it will be met by our Race Crew in time for final race preparations. The orange line in the image above details the sailing pattern that the semi will take aboard Höegh Ro-Ro Vessels . An integral part of our race operations, the semi enhances UM Solar’s mobility and ability to problem-solve on the fly. The semi will store everything our Race Crew will need to eat, sleep, and perform car maintenance while racing through the Outback. This means military-grade tents, car parts, tools, and—when it’s not driving or charging—the solar car itself. In short, the semi serves as a hub of operations that carries everything necessary for a successful race. This kind of support is crucial when competing in an event that can find the team as many as 300 km from the closest sign of civilization—often just a gas station. In the event that the car malfunctions, underperforms, or is damaged while on the road, the semi holds enough materials for the team to fix or even completely rebuild any part of the solar vehicle. The only exceptions are a few components that are impossible to build on the road, like the carbon fiber chassis. The Outback is unpredictable and solar racing is grueling, so the insurance provided by our semi trailer is indispensable. As the only solar-racing team that utilizes a semi-trailer over a smaller box truck, we believe the comprehensive inventory of supplies it allows us to carry give us a competitive edge. Höegh makes this competitive edge possible by transporting the semi on their Roll on-Roll off service. With up to six meters of free deck height and the ability to load cargo as heavy as 375 tons, Höegh’s Ro-Ro vessels are more than capable of transporting our full-sized semi trailer. With 90 years in shipping, the experience and expertise that Höegh has built over the years gives us the confidence that their fleet is conceivably the best equipped in the world to safely and reliably ship our semi to and from Australia for us. Our partnership with Höegh allows us to bring our semi-trailer to and from Australia for every race—allowing a level of support unmatched by any other team in the race,” Operations Director Peter Rohrer explains. “Without Höegh’s generous support, we would be hard-pressed to maintain the level of excellence we rely on." UM Solar’s semi-trailer is loaded onto Höegh’s H. Yokohama v49 at port in Baltimore. In the Fall, after UM Solar has completed the World Solar Challenge, Höegh will not only ship back the semi-trailer, but the solar car as well. Safe transportation is crucial for the car. With its fragile solar array affixed to the top and ultra-light aerobody, our car is a highly specialized and expensive vehicle that must be handled with care. This is guaranteed; Höegh’s cargo handling personnel are on-site at both load and discharge to carefully monitor the cargo operations. Furthermore, by stowing the car under deck no seawater, which can cause erosion, will reach the vehicle during the entire transportation process. Höegh Autoliners has supported the team since 2015, and we have always had very positive experiences with Höegh’s handling and shipment of our solar cars; we know we can trust Höegh with our most exciting vehicle yet. The support of Höegh Autoliners sets up the University of Michigan Solar Car Team for success in the 2017 World Solar Challenge, and makes possible high-functioning race operations in the middle of the Outback.